Bali is one of the world's most celebrated holiday and travel destinations. The combination of spectacular beaches, warm hospitable people and a rich visual and cultural experience are some of the key reasons Bali is so popular with travellers of all types and ages. Bali is most famous for its surf beaches, its nightlife and its wide range of accommodation options ranging from 5 star hotels, resorts, and private villas right down to budget options for backpackers. Bali has holiday experiences that cater for families, couples and even groups of friends. 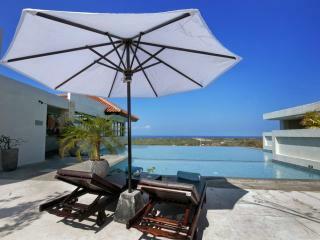 Bali accommodation comes in a huge range of styles and price ranges. 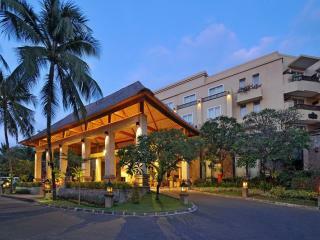 Bali is well known as a budget holiday destination with a large range of very cheap accommodation. 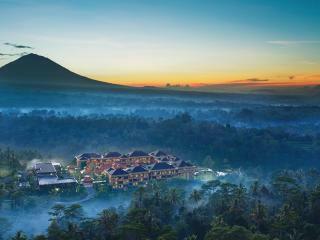 Bali does however also cater to travellers desiring more luxury style resorts, hotels and villas. TravelOnline is an online travel agency that is here to provide all the information you'll need about Bali holidays to make an informed decision on where to stay and how to get there. TravelOnline gives you Instant Quotes and access to the latest Bali accommodation and holiday packages. Beach activities would have to be at the top of the list for most people travelling to Bali. 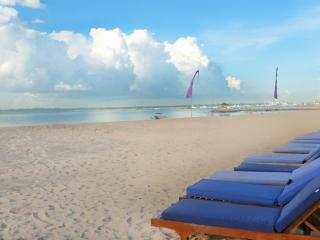 Popular beach activities include swimming, surfing and wakeboarding, or sunbathing with or without a relaxing massage. It doesn't stop at the beach though with a myriad of shops and markets where you can pick up that antique treasure or special Balinese souvenir. Of course the nightlife is a huge drawcard for many people looking for the excitement of the bars and clubs or interesting restaurants. Many resorts also offer a range of guest activities for example golf, spa treatments or motorised water sports. Being close to the equator, the average temperature for Bali is much the same all year round with a maximum between 25 and 28 degrees. The best time to travel to Bali is generally considered to be from June to October with other months being more humid, windy or rainy due to the monsoon or other seasonal weather patterns. Visit our Bali Weather page for more information. TravelOnline has assembled a range of Bali Holiday Packages to help travellers package compatible additions to their holiday accommodation at a discounted price. Typical additions might include accommodation, meals, transfers, tours, or flights. These packages can be modified further to suit the travellers individual requirements. Bali is a popular island for international tourists and is part of the country of Indonesia. The population of Bali is a little over 3.5 million. Balinese Hinduism is the most common religion followed by over 93% of the population, with most of the remainder being Muslim. The provincial capital Denpasar is at the southern end of the island. The southern region of Bali is home to the majority of the most popular holiday destinations and all of these are in easy reach by taxi from Bali's International Airport.